Hi, I’m Leroy Brown! I was originally rescued from a junkyard in Minnesota (who’s ever heard of a junkyard pug?) but I was taken indoors and I like it much better. Pug Partners took me in after my previous owners couldn’t take care of me any longer. I had a bladder infection and I had so much weakness in my back legs that I couldn’t walk. Pug Partners treated my infection, took me to physical therapy and gave me medical supplements to help with my joints. I’m so happy that I can walk now so I can follow my foster parents wherever they go in the house. I hate to miss any of the action! I’m a very sweet, loving boy and I love to be around people, especially if they’ll give me belly rubs! During the day I follow the sunbeams as they move around the house – they make the best spots for napping! Come visit me at a Meet & Greet and see for yourself just how adorable I am! Interested in adopting? Leroy’s minimum adoption donation is $250. 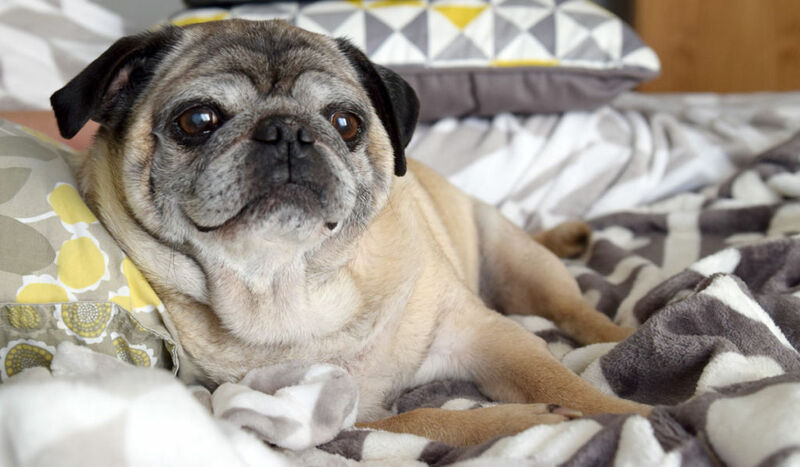 During March you can adopt Leroy or another senior pug (9 years or older) for $50 off their regular adoption fee.